The Wizarding World of Harry Potter – my books. my life. I promised a post about The Wizarding World of Harry Potter way back in August when I first visited. Somehow that never happened. Now that I have been there twice more due to the visits of Susan and Emily (I am certainly getting my money’s worth out of my annual pass to Universal), I figured I really better get a post up. Any Harry Potter fan will enjoy the Wizarding World of Harry Potter. A lot of thought and detail went into it and it really shows. However, it is only a small portion of Islands of Adventure so I am not sure it’s necessarily worth a trip alone. But if you’re in Orlando anyway, or you’re planning a few days at the various amusement parks, definitely go visit. There are only three rides and two of them existed before it was converted to Harry Potter. The new ride, The Forbidden Journey, is fantastic. And waiting in line is half the fun. You walk through Hogwarts (the greenhouses, Dumbledore’s Office, the Defense Against the Dark Arts classroom, and lots more) before getting on the ride. The ride takes you on a half virtual/half actual journey through Hogwarts. You fly through the castle, evade a dragon, dive into the Chamber of Secrets, and soar over the quidditch pitch. They did a great job with it – so much that I actually have to close my eyes when the dragon gets close and flinch when the whomping willow comes my way. The other two rides are Dragon Challenge (a double inverted rollercoaster) and Flight of the Hippogriff (a mild roller coaster). Those lines are not quite as nice but you still get to see some interesting things. Dragon Challenge takes you through the Triwizard Tournament and Flight of the Hippogriff shows you Hagrid’s Hut. Apart from the rides, there are the shops you would expect. You can shop at Honeydukes, Zonko’s, Ollivander’s, and Dervish and Banges. 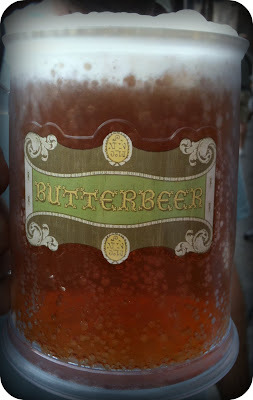 And of course, you can buy a butterbeer at The Three Broomsticks, the Hogs Head, and various carts. Some of the stores are combined. Be prepared to spend some money. There are other store fronts lining Hogsmeade/Diagon Alley but they are all “closed.” You can also watch performances by the school choir (w/ frogs) and the students of Beauxbatons and Durmstrong. My only complaint (aside from the crowds and the heat which can’t really be helped) is that it is too small. I hear rumors that they are going to expand it and I hope they do. The rest of Islands of Adventure is actually kind of lame so it wouldn’t be a loss if they converted more of it. I have many, many more pictures but I don’t want to make this post any longer. If you make it to Orlando to visit, let me know what you think. I do agree it is a bit small. I just realized I haven’t gone on the dragon ride ever since they converted to Harry Potter so I didn’t realize the line has Harry Potter things… cool! I actually like most of the rest of IoA, lol!! I wouldn’t mind if they got rid of the Seuss part I guess or most of the area that has Jurassic Park.. The Dragon Challenge line is not very fun to get stuck in. I’m not sure it’s very different than it used to be but with a few things to walk by once in awhile. I think the only other part of Islands of Adventure that has any merit is the Marvel section. I heard it was the Lost Continent part that Harry Potter is taking over. The butterbeer is nonalcoholic but on this last visit someone said you can get it with alcohol if you get it at the Hog’s Head. Haven’t tried it yet. I really wish this was open when I went to Orlando for a Bat Mitzvah earlier this year. Hopefully, we can make it down there again. Maybe I can do one of the Disney races to make the flight worth the money.